Should the Rolex "Bakelite" GMT-Master be resurrected? In the past, Tempus Machina has taken new Rolex Submariners, HERE and HERE, and modded them to look like vintage models. And now, they’re doing the same thing with the new Rolex GMT-Master II (Ref. 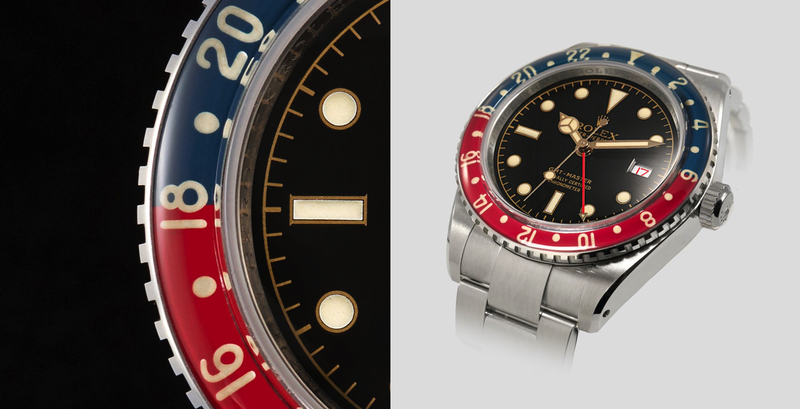 116710) and made it look similar to the original GMT – which is highly collectible and very rare – the “Bakelite” Ref. 6542. The original Rolex GMT-Master 6542, one of the first “Professional Watches,” designed specifically for pilots flying commercial airlines internationally, has already been recreated to some extent by the true watchmakers at Rolex in white gold with a Pepsi Bezel. And while it is not available in steel, with a gilt dial, or with the extra beveling to the lugs, that you see on the so-called 711Z GMT Master, would you really want to buy such a watch? Especially considering the lofty price ($35,000), and maybe most importantly that the company is a novice at best, surely not able to guarantee professional level quality as seen on a factory Rolex. Then again, maybe like the original Bakelite, the bezel will start deteriorating on these and so they will be the must have collectible watch decades from now. Although that’s highly unlikely.